With the growing popularity of water based cleaning chemistries and new solvent technologies, the debate between water based and solvent cleaners rages on. Companies that have cleaning requirements, including industrial, precision, and specification driven applications must decide which material is best for their applications and their business. And having the facts is the first step. In this post, we’ll go over these two cleaning materials to help make your decision a lot easier. For our discussion, a solvent cleaner or solvent degreaser uses a liquid to dissolve a soil. It can utilize one solvent, a variety of solvents, or a variety of solvents and compounds to maximize performance parameters for a specific application. Solvents can be broken down into their basic functional compounds, such as alcohols, ketones, aliphatic hydrocarbons, etc. Each chemical category has specific characteristics that lend to different solvency profiles, and the addition of different compounds and mixtures provides the range of solvency seen in commercial products. These different solvents and cleaning solutions can be tuned to remove a specific soil while leaving other materials relatively untouched. Some familiar solvents include acetone and butyl acetate, which is found in local hardware stores, alcohols such as isopropanol and ethanol, and even gasoline which is a mixture of hydrocarbons. Water is also a solvent and is a subsection of the solvent category. Water based degreasers utilize water as the primary solvent, but can also include any of the solvents mentioned above, plus detergents, pH modifiers, builders, chelating agents, and a variety of other compounds. When these other compounds are used, water based cleaners can be very strong cleaners or mild, can be dangerous or relatively nontoxic, but they usually require a rinse step. The variety and complexity of water-based cleaners are enormous. The two are used in a variety of ways including degreasing, precision cleaning, ultrasonic cleaning, medical device assembly cleaning, and more. All solvents work by dissolving the soil; breaking it down into smaller particles and carrying it into the solution and away from the surface being cleaned. Many solvents offer an advantage of a quick cleaning, so the soils dissolve and flow off of the substrate without needing extended prep time, processing time or drying time. Solvent based cleaners remain popular in industrial applications due to their cleaning power; they remove thick, baked on oils, dirt, containments, solder flux, and greases. 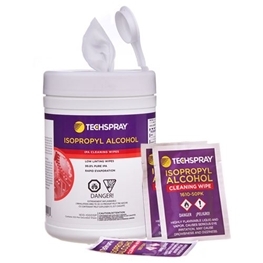 Some examples of strong cleaning solvents are acetone, methyl ethyl ketone, toluene, nPB, and trichloroethylene (TCE). 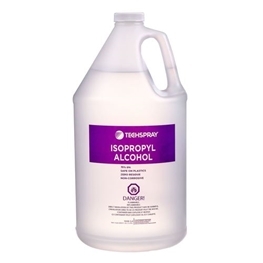 Common mild solvents include isopropyl alcohol, glycerin, and propylene glycol. In this case, the terms “strong” and “mild” are arbitrary designations, which means solvent strength depends not only on the soils being removed, but also on the amount of soil to be removed and the level of cleanliness that is required. Solvent based cleaners can be fast evaporating or slow evaporating, high in odor or low in odor, plastic safe or very aggressive. The variety of solvents lends to being able to create very specific cleaning chemistries for removing specific soils from substrates. Some cleaners are capable of removing a specific ink on a plastic substrate while leaving others completely untouched. When choosing a solvent cleaner, one of the first questions is whether a flammable or nonflammable solution is preferable. If flammable solvents can be safely used and there are no ignition sources, there is good air turnover, and all safety protocol can be followed, flammable solvents tend to be much less expensive in general over nonflammable solvents. However, if any of the safety concerns are an issue, there are many nonflammable solvents to choose from. Solvents evaporation rates are available that are immediate volatile, and others that only evaporate at elevated temperatures. Those that evaporate immediately may be better suited to minimizing process downtime, while those that evaporate much more slowly are better suited to elevated temperature soak applications. There is not a single solvent that works for all applications. Also, those that evaporate more slowly are less likely to be VOC’s but may need an additional drying process. Surface tension is a measurement of a liquids ability to wet a surface or its ability to pull together into a cohesive droplet. The lower the surface tension of a material, the greater the ability for the material to wet a surface, and lay down a thin even coat. When the surface tension is high, the liquid tends to pull together to form droplets. In general, solvents tend to offer lower surface tension than water-based cleaners, providing the ability to permeate into tight clearance areas to remove soils, without being entrapped. All solvents and cleaners, in general, should be handled while using personal protective equipment in well-ventilated areas to minimize exposure. Follow the recommendations offered by the manufacturer’s SDS. A growing concern with many solvents is whether they contain Volatile Organic Compounds or VOCs. VOC’s are materials that readily evaporate and turn into the gaseous state at normal room temperatures, and their ability to contribute to smog formation and the environmental and personal health impacts associated with them. This is one reason low or no VOC solvents are becoming such an important issue as companies are using them to meet air quality standards and to improve worker safety. There are a variety of tradeoffs that can accompany the use of solvents that do not contain VOC’s. One is the possible increase in the drying time of the cleaners. This is the case for both water-based and solvent based systems. One of the ways to decrease the VOC impact of a cleaner is to add slow evaporating solvents to the mixture that minimize the VOC contribution to the environment. This can be the addition of certain materials that act like oils, or in some cases adding water mixtures to the cleaner. In either case, additional processes including rinsing, drying heat tunnels, or reclamation procedures may be required to meet the required process parameters. Another tradeoff can be the use of VOC exempt materials, such as acetone, siloxanes, and PCBTF. While these solvents are generally strong cleaners, they are flammable and the acetone and PCBTF have high odor levels. Acetone is a relatively low cost but the PCBTF and siloxanes are much more costly. Other VOC exempt materials, such as HFC-43-10mee, do not have sufficient cleaning ability to remove most soils when used by itself and must be mixed with other stronger solvents to increase the cleaning ability. Water-based cleaners remove soils not only by dissolving contaminants, but they can also chemically react with the contaminants and make them more readily dissolvable in water. For example, some materials will react with or dissolve more readily into an acidic solution (pH of 7 or lower). Some common acidic materials can be found in lemons (citric acid), vinegar (acetic acid), soft drinks (carbonic and phosphoric acid) and car batteries (sulfuric acid). Other materials are more readily reacted with or dissolved into a solution with a pH above 7. These solutions are caustic, or alkaline. Some common caustic materials are ammonia, bleach (sodium hypochlorite), lye (sodium hydroxide), and oven cleaners (more sodium hydroxide). Detergents or surfactants – materials that have wetting and emulsifying properties, and can carry soils into a solution that would not otherwise go. Builders – materials that increase the efficacy of detergents in water by adding alkalinity to solutions. Emulsifiers – liquids that can carry oils into water solutions, creating a liquid in liquid solution. Saponifiers – materials that will react with fatty acids and other carboxyl groups to form water-soluble soaps that can dissolve into the water solution. Sequestering agents – bind with calcium, magnesium and other metals in hard water that detract from the overall cleaning ability of the cleaner. Sequestering agents can bind with more than one metal ion at a time. Chelating agents – similar to sequestering agents, but bind to one metal ion only. The combination of water, solvents, surfactants, and saponifiers can be as effective as solvent cleaning, but often requires a change in the cleaning process. In a high precision application where residues cannot be tolerated, a rinsing process is often required with water-based chemistries. Batch or in-line cleaning systems generally have rinse and dry cycles to overcome these issues. Evaporation: Water-based cleaners function in a much narrow range of evaporation range when compared to solvent cleaners. While solvent cleaners evaporation range can be from instantaneously to taking months, water based degreasers are typically in a much narrower range. They typically are not left to evaporate on their own, and can normally be used in a cold or hot soak application. Temperature profile: Cleaning temperatures for water-based chemistries can range from room temperature up to about 80C, depending on the cleaner and formulation. Although this provides a great deal of process variability, this is much more limited when compared to solvent cleaners. Solvent temperature cleaning range can be much wider just based on the variety of solvents available, from below 0C to above 200C. Higher surface tension: In general, water based cleaners have higher surface tensions when compared to solvents. Raising the temperature, using different surfactants and emulsifiers, and incorporating spray and drying systems can overcome much of this shortcoming, but for the tightest clearance areas, solvents with low surface tension have superior ability to wet into and evaporate out of tight spaces. may contribute to electrical leakage, coating dewetting, and a variety of other defects. Rinse and Drying: As noted above, rinsing and drying removes any cleaner components and solubilized contaminants. While some solvent cleaning systems also require a rinse and dry process, water-based systems are usually more involved when compared to vapor degreasing applications. Montreal and Kyoto protocols limit categories of substances like CFC’s (chlorofluorocarbons), HCFC’s (hydrochlorofluorocarbons), and HFC’s (hydrofluorocarbons) due to ozone depletion, global warming, and other environmental concerns. EPA (Environmental Protection Agency) and state agencies like Cal-OSHA (California OSHA) limit personnel exposure to toxic chemicals. CARB (California Air Review Board) restricts smog-producing VOC’s (volatile organic compounds) in cleaners based on specific cleaning categories. Hazardous Air Pollutants (HAP’s). Hazardous air pollutants (HAPs) are those pollutants that are known or suspected to cause cancer or other serious health effects, such as reproductive effects or birth defects, or adverse environmental effects. Some solvents are considered a HAP, and in general water based chemistries do not contain HAPs. Priority Pollutant List. These are a set of chemicals that the EPA regulates, and has analytical test methods for detecting under the Clean Water Act. Here again, several solvents are on this list, while aqueous cleaning chemistries are not. These regulatory pressures force manufacturers to evaluate new cleaners and cleaning processes to overcome these hurdles. In response, water-based cleaners are becoming more common in the industry. Which cleaning chemistry is best for you? Both cleaning technologies have the potential to be very effective in terms of performance – however, the cleaning ability depends on what is being cleaned off of the surface, the substrate being cleaned, and the process constraints and requirements. All three parameters must work in tandem for the best cleaning results. To choose between an aqueous cleaner vs a solvent, one must evaluate your unique application, requirements, and goals. Then, you must consider safety, performance, and cost of the solution. A good cleaning agent that is made specifically for removing handling soils may not remove machine greases, a cleaner that works well on stainless steel may not be compatible with glass lenses, and a cleaner that removes machining oil may not be clean enough for a liquid oxygen line. The bottom line is that it’s impossible to make an overall credible judgment of the superiority of solvent or water-based cleaners without evaluating the unique situation of the user. Luckily, even with the ever-mounting regulations, there's still an array of choices that include both solvents and water-based cleaners. 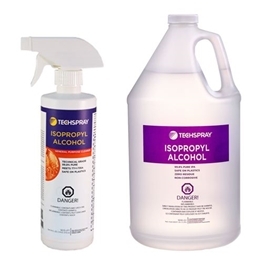 There you have it -our comparison of solvent and aqueous cleaners. Be sure to post your questions and comments below. And if you still need assistance choosing between a solvent cleaner and water base, speak with one of our product specialists. They’ll help you get the right product for your application. From ACGIH website, https://www.acgih.org/about-us/history, accessed 07-20-2018. Adapted from pages 14-16, “The Aqueous Cleaning Handbook”, McLaughlin and Zisman, ISBN 0-9645356-7-X, published 2000.